after playing a little with train overtaking loops and reading some discussion about it, I decided to create a railroad sign with minimum speed. This allows to mark a part of track to be accessible only to high speed trains (express passengers) and exclude slow (cargo, commuter) trains. It simplifies usage of overtaking loops, with them there is no need form manual waypoints. I have modified Fabio's one-way signs to keep the visual style, just modified them to show green H (High, Hoch, Haute,... speed) to be easily distinguishable from other signs. It comes in two flavors - minimum 100 km/h (from 1920 to 1970) and minimum 160 km/h (from 1970 to future). If other speed or intro dates would be better, just say so or modify the file yourselves. I think minimum speed signs for railroad is something needed in simutrans. I've missed them a few times while playing. Thanks for providing them. Personally, I think there even is room for multiple of them, let's say 80, 160 and 240 or so. However, you graphics reminf me too much of the "H-Tafel" (I don't know the englisch name). It is a rectangular signal, white with a black H or black with a white H, which marks the place at a platform where the train should halt (at least in some European countries). Unfortunately, I don't know a good design for the minimum speed signal (since it doesn't exist in the real world). MAybe a white triangle with red border and a black K (like http://www.tt-module.info/Betriebshandbuch/Signal/zs4-f.gif which was used to signal to the driver to go faster than the schedule says)? Or a balise between the rails, since these are commnoly found on high speed lines? ^ I have proposed a user editable speed limit sign before, so I can only guess that it's in the works. For now, you should be able to easily create your own signs with the dat and png provided. But IMHO this could be suitable only after 1970. I believe high speed sign should have min speed set to 200 km/h, as in the European framework a line is considered to be high speed if it allows speeds exceeding 200 km/h. There could be a different sign for 1920+, with min speed 100 km/h (not retired, so that after 1970 you can set a min speed of 100 km/h OR a min speed of 200 km/h. 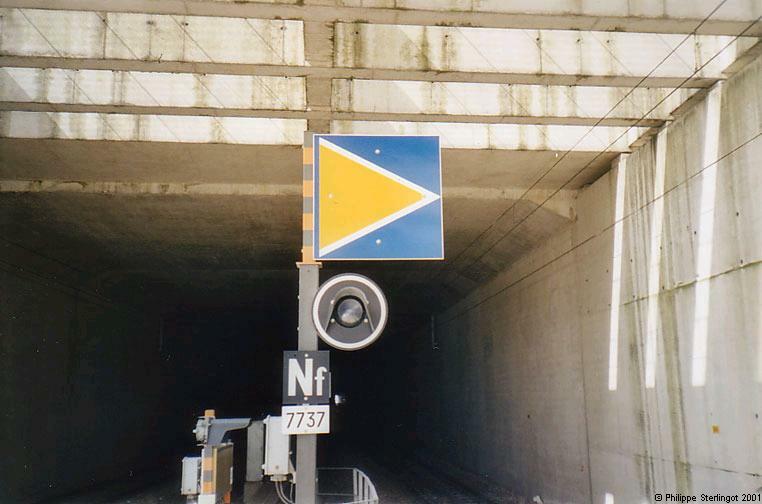 Blue square for 100 km/h (totally fictitious); blue square with yellow arrow for 200 km/h (ETCS). Another idea I had was to use ETCS balise SIGNALS between tracks with a built-in min speed limit 200 km/h. I would not recommend balise. If I googled right its just some small box between the rails. It will be just a few pixels, almost invisible as bollards are. However this blue/yellow sign looks ok. What about speed of 220 km/h and intro year 1981 (when the first TGV line opened)? My reasons for chosen speeds and dates were to be consistent with the existing singals for pak128, which change design in 1970. And at that time there are only a few engines that can run at 160 km/h, and almost no cargo cars are faster that that even in future. Only cooled and boxed goods get over that speed. Anyway, the best way would be in-game configurable sign. Otherwise it should be up to the pak maintainer to choose some well balanced speeds and intro/retire dates. 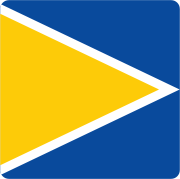 Hmm, so how about the red triangle with K for the early (and lower speed sign), and the yellow triangle on blue for the later (higher speed) one? I think the red triangle with K is used as a hand-held signal by rail station staff. But I have one more question. Would it be possible to change the code to allow for min. speed sign combined with signal/presignal. True, but I see no good alternative for an early min-speed sign. Maybe do both sign suggestions but for diffrent speeds, like blue/yellow signs for higher speed limits than 150K/ph and the red triangle with a K for any speeds below that. Oh and also, are the limits going to increase periodically by 10 or what? Oh and also, are the limits going to increase periodically by 10 or what? No I'm not going to make that many signs. These three are enough for me. But anybody is free to modify them, or to draw some other design. Well, I could not sleep because of these signs. Here are some further mods. H signs (Hoch, not Halt ) are recoded as one-way and min speed at the same time, like highway signs for roads. (speeds 100, 160). TGV signs - Red/White for 110 km/h, and Yelllow/Blue for 220 km/h. I might look into this. Anyone else has anything to say?